Q: I’m interested in attending one of your meditation sessions, but I’m just learning about Buddhism. Is it okay if I come? A: Yes, absolutely; please do come. Our Saturday session is aimed at beginners so that’s a good place to start. The Sunday practice is also very basic and easy to understand, and very open to newcomers. You can meet more of the “regulars” at Sunday practice. If you prefer to come during the week to an evening practice, that’s fine. We’ll explain the practice before we start. Q: Is there a dress code for the practices at Three Rivers Dharma Center? A: No, but please dress modestly and wear comfortable clothes. Please refrain from using perfume or cologne. Our custom is to remove shoes when entering the house, so be prepared for that. Q: Do I have to sit on a cushion? A: No. Most people sit on cushions, but there are also chairs available. Q: Do you charge any fee to attend? A: We don’t charge for any of our practices or teachings. But, we do have a donation box out for donations from visitors. Please give what you can. 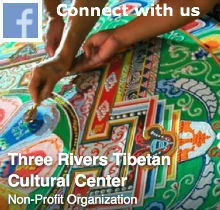 Donations are important to sustain our center’s many teaching and cultural activities. We appreciate any support that you can give. Q: Is the center handicapped accessible? A: Unfortunately, no. Our center is in a house with about five steps to get to the front door. At this time, there is no ramp. Once inside the house, there is not a bathroom located on the first floor. Our long term plan is to address these issues, but right now we don’t have the resources to begin. Sorry. Q: I’m a student and my class has the assignment of visiting a different religion or church. Can I come for a visit? A: Yes. The Saturday morning session is primarily teachings for beginners, while the Sunday morning one is a ritual practice with prayers and meditation that a lot of our “regulars” come to. So either of those would be good choices; or you can come to a weekday evening practice. Please don’t expect to take pictures during our practice, and we expect you to participate in saying the prayers and trying to do the practice. At the end of the practice, there will be time for any questions you may have. Q: I’m a teacher and would like to bring my class to your center. Is that possible? A: Please contact us first and make some arrangements. Our center is small and can’t really accommodate a large number of people. But we do have a beautiful Tibetan style shrine that may be of interest. Another possibility could be having Khenpo Choephel come to your school. He can talk on Tibetan culture and arts as well as Tibetan Buddhism.